Home GP Services Can ultrasound be used during fertility assessment? There is a role for ultrasound but it is not the only investigation used during fertility assessment. However, for the scope of this article I will concentrate on the uses of ultrasound. 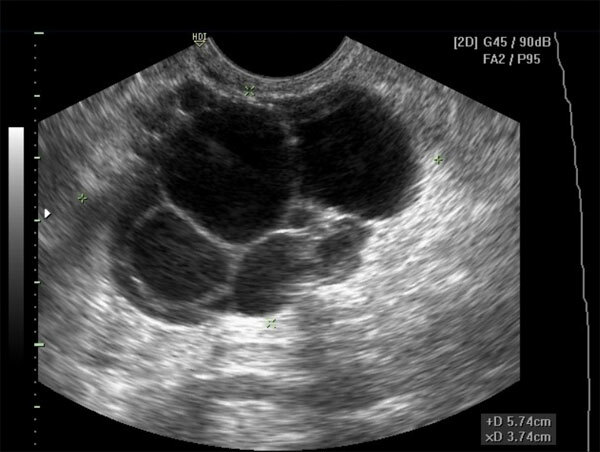 Firstly ultrasound can be used as a basic imaging assessment to screen for abnormalities of female reproductive organs. A transvaginal ultrasound can be performed to visualise the cervix, uterus, uterus lining (endometrium), and ovaries. Should there be any obvious abnormality such as anatomical variants (e.g. bicornuate uterus, didelphys) or physical abnormalities (e.g. 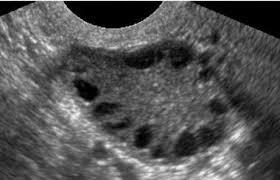 fibroids) this can be assessed at screening to identify whether a formal scan needs to be done followed by a specialist appointment. When visualising the ovaries we can assess the size and shape as well as the number of follicles present. The number of follicles will depend on where you are in your cycle, which is why it is often necessary to perform two scans 6 weeks apart to ensure that we scan at different points in your cycle. This is important because follicles (which are normal) have the same appearance as cysts (which are abnormal but not often serious). If the number of these lesions varies between scans then they are much more likely to represent follicles. If they persist and are relatively unchanged in size and shape then cysts are more likely. On the left we have ovarian follicles. On the right we have cysts. Very similar right? That’s why we assess at different points in your cycle to help differentiate the two. This leads on to a common problem that may cause sub fertility in women; polycystic ovary syndrome (PCOS). PCOS often causes problems with fertility due to the hormonal imbalance it can cause with the most common problem being irregular periods. This leads to difficulties assessing the exact time of ovulation. The hormone imbalance can also cause problems even if fertilisation occurs; with hormone imbalance, let’s say too much oestrogen, the endometrium which will support the baby during pregnancy is not maintained despite successful implantation and then your menses will occur as if implantation had not taken place. This can be a frustrating time but performing an ultrasound of the ovaries can allow us to diagnose PCOS and decide upon treatment. Almost lie a string of pearls if one can stretch the imagination! 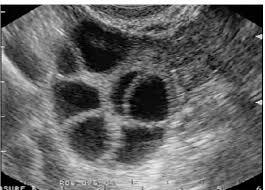 Finally serial (over a period of days surrounding the ovulatory period) ultrasounds can be done. The reason for this is to identify a dominant follicle which will release the ovum/egg. As the ovulation time draws closer there will usually be one follicle (which can be either in the right or left ovary) will start to get bigger as it matures. Regular ultrasound over this period can allow us to identify which follicle is dominant. Eventually once ovulation occurs the follicle then becomes the corpus luteum, which releases the necessary hormones over the next few days to maintain the endometrium and allow the embryo to implant. Once successful implantation occurs, hormone production is taken over by the developing embryo and the corpus luteum regresses back into the ovary. 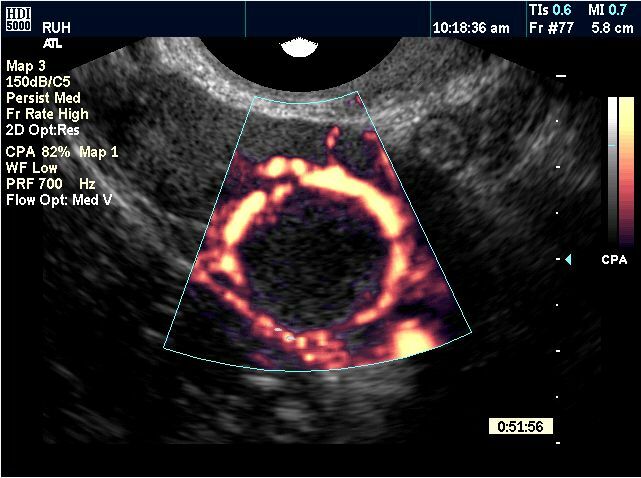 On ultrasound the corpus luteum has a classical appearance, known as the ring of fire. This is because the outer ring portion is very vascular in order to produce and release the necessary hormones. By identifying the corpus luteum known that ovulation has occurred and you will be at your most fertile during this period (around 72 hours). Hopefully if everything goes well and successful implantation occurs then the first step of pregnancy is underway. The next step will be early pregnancy scanning at 6-8 weeks to identify the baby as well as its heartbeat. But this was covered in a previous article. Hopefully this has illustrated some further uses of ultrasound in pregnancy but you can always come to our clinics for further information, although the Bencoolen clinic is preferred as this is where our ultrasound machine is located. milky substance has bin coming out of my breast for some years bt I finally treated it dis year and it has stopped bt my question is “can it delay child bearing? Anoda question is: I went to two different hospitals to test for my blood group nd genotype nd they tested differently,wat could b the cause of it? the water coming out of my breast has lasted for some yes before I treated it this year. my question is do u think that it will delay child bearing? I am anxious to carry my baby bt there was a time that whitish water was coming out of my breast although my doc has recommended a drug for me nd it worked. My question what if it has lasted for some years before treatment, wat happens? Hi, i don’t quite understand your question. Could you rephrase it?